I'm going to tell you straight off that you'll notice that most of the pictures in this post seem to be from the same two days. You would be right. I completely failed to take pictures most of the week, but in my defense the week was mostly standardized testing and doctors. I did try to remember to take pictures at the homeschool group enrichment classes, but you'll see that I was not a huge success in that either. Most of the school for this week was standardized testing. We aren't quite complete either and will finish on Monday. Amber had an appointment this week; Fred had an appointment on the same day. That day was pretty much useless for school. We also don't accomplish much on homeschool group day either. Then we had the added bonus of the fun homeschool Easter party today. So, no testing again today. Amber did learn a bit about allergies, allergy shots and genetics on Tuesday. 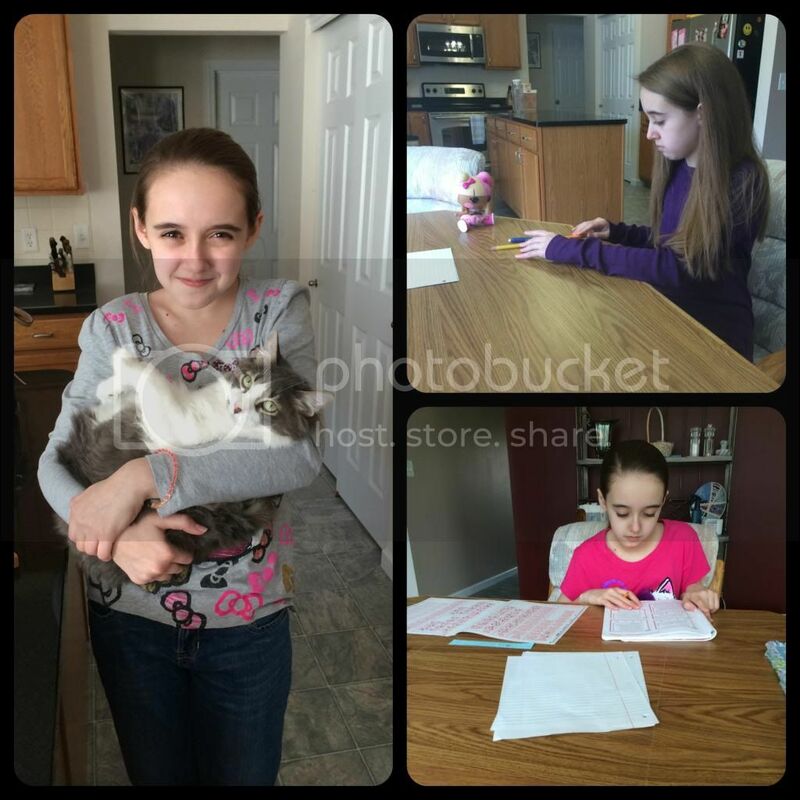 We visited Amber's allergist for the environmental allergy testing, again. Same two trees popped up on the test as well as... cats. Amber is allergic to her cats. This explains much of the nasal issues and coughing of late. Instead of finding new homes for our beloved cats, Amber is taking medication and starting allergy shots. Life is never medically dull around here. (LEFT) Defiantly holding her favorite cat after returning from the allergist, who did recommend we give away our cats. (RIGHT) Two different days of standardized testing. Such exciting times. There hasn't really been any new food for Amber this week. Yellow bell peppers passed the food trial over the weekend, but it was only one small slice. We will try again sometime when she is feeling adventurous. However, this gives us great hope that there are vegetables and fruits out there that she can consume in moderation. I've been in a fog and feeling sick for a lot of the week and it's my fault. Fred even warned me in advance; Amber told me I was making a bad choice. Tuesday I had a pretty busy day because of needing to have Amber at the allergist early, then taking her to my mom's where I met Fred so we could drive into St. Louis for his geneticist appointment (all came out well)pic. The timing was not ideal for lunch, so we grabbed fast food that I could eat while driving. I chose to eat a wheat bun. My body chose to explain what happens when a highly gluten intolerant person eats an entire wheat bun. 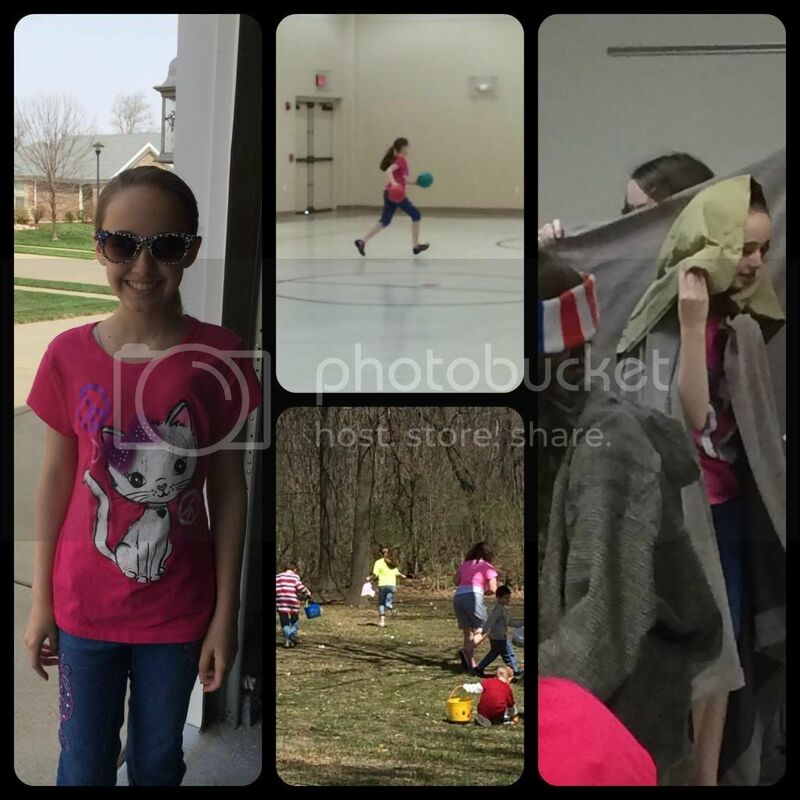 Today was our homeschool group's Easter party at a local park. The kids, of all ages, were able to hunt for eggs and play together on the playground. Some of the older kids also played kickball. Originally Amber was gung-ho to play kickball, yet when the time came she was enjoying herself too much to be moved from the playground. She played so hard today and over did it, just a tad. I thought she looked a bit worn out, still she would not admit to it until we were halfway home. Then she sorta fell apart into a puddle of exhausted and hot child. She's resting in the cool air conditioning now and doing much better. (LEFT) New sunglasses and shirt. She is really not happy about this cat allergy. (TOP-MIDDLE) Homeschool group time: playing in the gym with the big kids. (RIGHT) Assembling her goblin costume for The Hobbit - homeschool group play. While this has been a fairly uneventful week for school, it was long and tiring in so many other ways. We have a service event at church tomorrow for Amber and me, then more outside house maintenance if the weather holds on Sunday. I'm actually looking forward to the rain forecast for Monday so that we can stay home and not have anything out of the ordinary to do. So concludes my very sleepily and groggily written weekly wrap-up post. I am glad you will be able to keep the cats. That would be terrible to have to give them up. I hope your body is feeling better soon. I am allergic to cats too but that has never stopped me having them! Thank goodness for modern meds. I hope you have a relaxing weekend after your tiring week. I think you took more photos than I did. My camera was not out much this week. Sorry to hear about being allergic to cats. I unfortunately am also allergic to cats. Every time I got sick I ended up with bronchitis or pneumonia. That combined with these guys in the backyard of our old house (http://www.talesofahousehusband.com/2010/08/04/wordless-wendnesday-coyote-in-backyard/) meant that we decided that It wasn't a good idea for us to own cats anymore. The pictures were taken from my porch. I hope you are feeling better. There is nothing like having a child tell you you are making a mistake and still making it. Margaret has done that to me. How awful to be allergic to her beloved cats! My sister was allergic to cats when she was little but keeping them out of her bedroom Helped tremendously! I'm so glad that the yellow pepper was a success and very sorry that you had a bad reaction to the bun. It must be so hard to stick to your diet in circumstances like that, though. I hope you guys have a great weekend and a rainy Monday of rest! I am so sorry that Amber is allergic to her cats!! I so hope you are both feeling better. I just told Keilee that Amber is allergic to cats and she said, "Oh no she loves her cats!!" Here's hoping that the upcoming week will be more productive and healthy for you all. Hugs my friend.